Sankarshan Dasa Adhikari - Jan 12-15, 2017 ~ The Toronto Hare Krishna Temple! Toronto's Hare Krishna Temple is excited to welcome back Sankarshan Dasa Adhikari to the Greater Toronto Area from Jan 11-16, 2017. Traveling across the globe, Sankarshan Dasa Adhikari is a teacher, author of several books, and personal mentor and guide to tens of thousands in over 100 countries. He explores and makes knowledge from the ancient Vedic scriptures relevant to us in modern times. Together with his wife and teaching partner, Vishnupriya Devi Dasi, he brings the purity of an ancient tradition, makes it easily accessible and applicable, and lays out a clear process to escape the clutches of our difficult lives. He shares deep spiritual insights and practices through his famous Ultimate Self Realization Course, a combination of email education, live classes over the Internet, and in-person live classes, seminars, workshops, all delivered lovingly as a service to humanity, without any barriers of fees or commercial exchanges. For an archive of his teachings, see www.sda-archives.com. Sankarshan Das Adhikari joined the Hare Krishna movement and received initiation from His Divine Grace A. C. Bhaktivedanta Swami Prabhupada in 1971. Since then, he has been serving his spiritual master's order sincerely and enthusiastically. He is an initiating spiritual master within the International Society for Krishna Consciousness. Everyone is warmly welcome to attend all of these exciting programs! 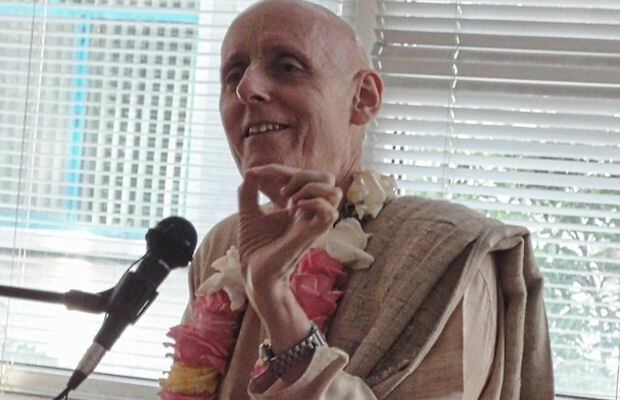 Hare krsna Kevala Bhakti prabhu.